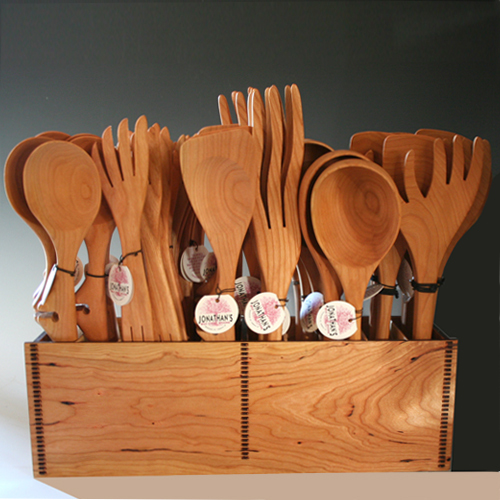 Utensils made from select cherry wood; band sawn, drum sanded, and finished in a food grade, light, mineral oil. "In all my work I strive to balance the tactile and aesthetic qualities with the use of efficiency and purpose. My utensils have a unique sense of balance and warmth because they are designed with the hand and purpose in mind". If you don't know about Jonathan's® Spoons; come visit him this February 16th - 18th at the 'American Handcrafted' Philadelphia Show. Forty years of wood-spoon making for the buyers market means a lot of experience and expertise. Enjoy his celebration in booth 714 ! Celebrating 40 years - and still designing ! 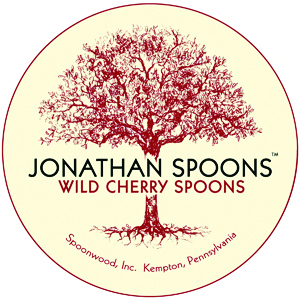 Wild Cherry wood spoons - spatulas and forks, mixed with salad sets and his famous Lazy Spoon® all designed by Jonathan's® Spoons in one organized box.